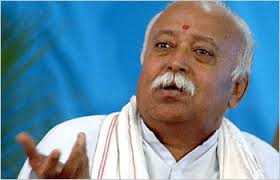 In a surprise move, a senior official of People’s Union for Civil Liberties (PUCL) has quoted RSS chief Mohan Bhagwat to justify his arguments in on working out a new education policy, for which Union human resources minister Smriti Irani had sought comments by December 15. In his letter to Irani, dated December 15, Gautam Thaker, general secretary PUCL, Gujarat, singles out Bhagwat to justify why commercialization of education should be discouraged. Reference to Bhagwat, rather than any other prominent educationist, to prove his point is intriguing, as it comes amidst human rights organizations, including PUCL, increasingly criticizing the Narendra Modi government for “following” RSS’ Hindutva diktat. “The RSS policy is that if you insist on a different point of view or disagree with the RSS, they will eliminate you.” Calling it “the legacy of Nathuram Godse”, who killed Gandhiji, she added, it is being resurrected to “silence” rationalists likes of Govind Pansare and MM Kalburgi, whose murders have provoked widescale protest against the Modi government. Interestingly, in his letter to Irani, Thaker, while providing his views on new education policy, does not even once recall the controversial books by veteran RSS "educationist" Dinanath Batra, which are now part of the state’s educational curriculum in Gujarat, with Haryana now all set to follow suit. Batra’s books propose to ban the teaching of foreign languages in schools, “redraw” the map of India to include neighboring countries such as Pakistan, Bangladesh, Sri Lanka, Nepal, etc., advises young minds not to celebrate birthdays with cake and candles, and, even as derogatorily identifying blacks as “Negroes”, seeking to suggest that they are criminals needed to be dumped. Writing as general secretary, Citizen for Democracy (Gujarat), Thaker, curiously, despite quoting Bhagwat, talks of the need for “secularization” of education, which seeks to scientific temper, on one hand, and value-based education on the lines of those suggested by Mahatma Gandhi and Vinoba Bhave. Seeking the implementation of the Right to Education (RTE) Act in its letter and spirit to promote universalization of education, Thaker insists that all children up to the age of 18 should be provided with free and compulsory education. Thaker’s letter to Irani – written in Gujarati, and sent on December 15, the deadline by which the ministry had sought suggestions from public on working out a new education policy – said that private investment in higher education, which was to the tune of 62.32 billion dollars in 2013-14, would double by 2018.